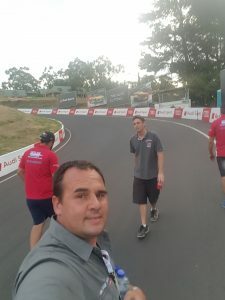 Take a good look at what car control under braking looks like , 25: 52 min into the Video Clip , and at the top the mountain no less, the Clift Brothers Racing team makes drivers with some Big Cajones as they say in Espanol. And with a bit of luck we will have you on some more rotor friendly Pads for the next big race . 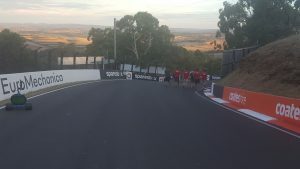 and for the Track Walk around Bathurst, memorable for many reasons in-deed. of brake and steering system upgrades that are so necessary to keep up with the ever developing race rules , technology and driver experience. 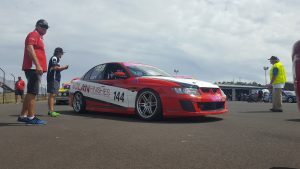 Look out for some upcoming Changes ** on this Cars all round VARI Race Brakes Full Race two piece rotor big brake custom kits. ** Note: The team has run our discontinued branding and logo Version of our Full Race 617 FR calipers up front and our some non matching first Gen 618 SL low vol VARI rear Callipers but will soon be be running a totally revised Front and rear Upgrade in the form of a full custom 2 Piece Rotor Set Up developed in conjunction with the pros at BHSS / TBS Capalaba.